Belfast's bow. Note the 6" gun turrets "A" and "B". 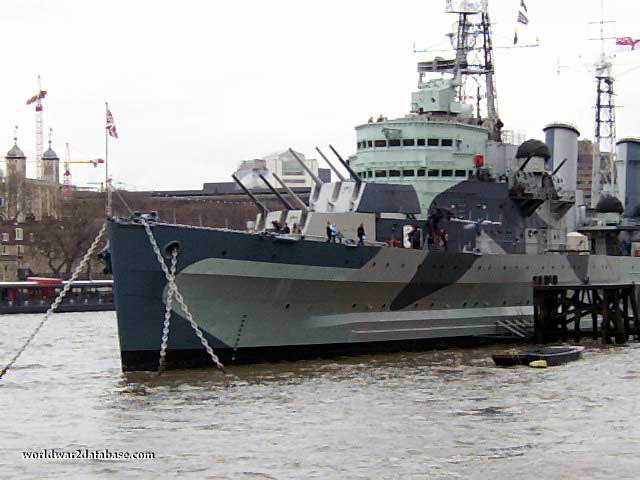 Originally HMS Belfast was to carry quadruple 6" guns in four turrets, but treaty limitations and technical problems limited her to the original triple turrets of other Town class cruisers. Belfast has two rear turrets, "X" and "Y". These guns have a 14.5 mile (23.2 kilometer) range.